How things can change in six weeks. Let's look at what Bank Reform Now, bank victims and bank warrior friends & supporters achieved between June 28th and August 14th 2018. There have been two motions put up in the Australian Senate since June 2018 - both asked the Senators to support a longer and stronger Banking Royal Commission. On June 28th 2018 the ALP and the Liberal Party voted No to extending the Banking Royal Commission. Senator Anning put forward a motion, similar to the one in June. Not one Senator dared to appear and vote against it. Therefore, as of that date, the Senate supports a more powerful Royal Commission. What changed in six weeks? Every Senator was emailed and or phoned about the banking issues and why the Banking Royal Commission should be extended. BRN sent each politician a document showing serious bank crimes that have not been looked at by the Royal Commission. Other bank victims and concerned citizens also contacted their Senators and MPs. Michelle Matheson’s local MP, Pat Conroy, stood in Parliament two weeks ago and told her story. View video with the transcript from parliament here >> Bank Victims Stories Reaching Parliament. On 14th of August 2018, at a forum initiated by Senator Anning, Australian citizens, voters, activists and patriots went to Parliament House in Canberra to speak or bear witness as over thirty victims of bank crimes and misconduct testified. The finance system is flawed, and the Banking & Finance Royal Commission has not gone deep enough. Much more needs to be done and it needs more time, powers and resources to do it. What we are seeing is people-power in action, and it works. 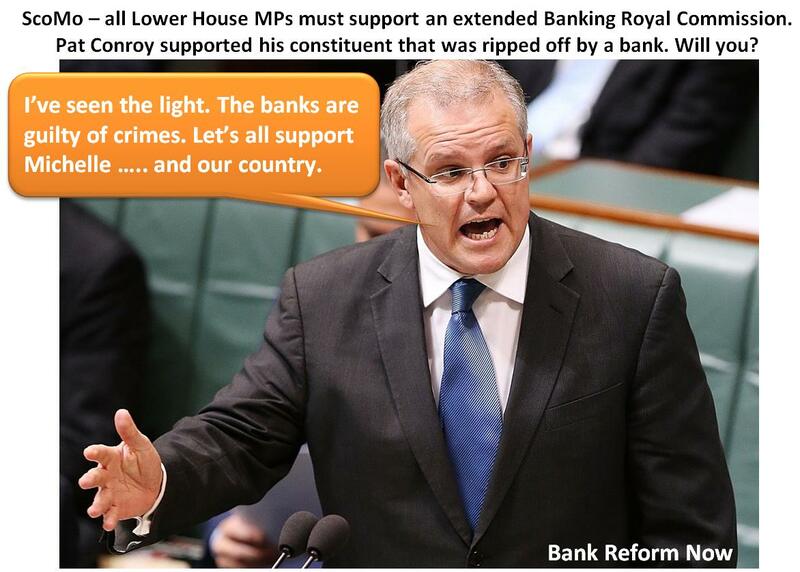 Bank Reform Now and other Bank Warriors are joining together to focus on the Lower House MPs. We want every one of them to realise that the jig is up. The banks have been exposed. Criminal activity is occurring, and it must no longer be ignored by politicians and the regulators. Please email these two to let them know we want an extended Royal Commission. You can also keep an eye on their Facebook pages too. We will never have a better opportunity to bring about critical reforms in the Australian banking and financial sector. Keep an eye out for the BRN Marginal Seat Campaign ... the pollies will not know what's hit them.